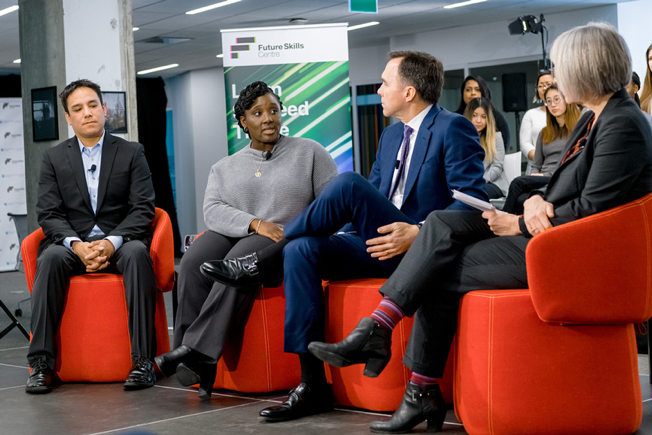 The future of work is changing – and ensuring Canadians are ready with the right skills was the key topic in a recent panel discussion at Ryerson University. “We know that the job market is changing dramatically. The Brookfield Institute at Ryerson talks about the fact that the next two decades, 70 per cent of jobs will be seriously impacted through automation and globalization. Forty per cent of jobs will actually disappear. That sounds dramatic, but we note that new jobs will appear,” said Canada’s Minister of Finance Bill Morneau who was part of the panel discussion. 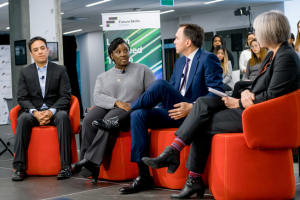 Minister Morneau was joined by Gladys Okine, of First Work, Ontario’s Youth Employment Network, and Lawrence Daniels of FireSpirit in Manitoba, joined Minister of Employment, Workforce Development and Labour Patty Hajdu. The future of work panel discussion was part of the launch of the Future Skills Centre announced at Ryerson University. Preparing for the future is exactly what the Future Skills Centre will focus on. Funded by the federal government, it is a forward-thinking research centre with a focus on how best to prepare Canadians today for workforce opportunities of the future. Ryerson University, which Magnet is part of, along with the Conference Board of Canada and Blueprint were selected to partner and operate the new Future Skills Centre. The Future Skills Centre will look for innovative solutions to best address the needs of those who are not currently participating fully in Canada’s prosperity—the under- and unemployed, women, youth, Indigenous people, newcomers, racialized people, persons with disabilities, veterans, and people from rural, remote and northern communities. 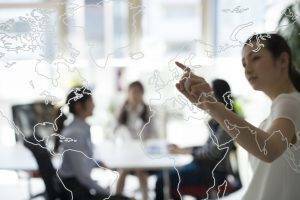 Magnet, a social innovation platform that addresses the unemployment and under-employment of Canadians, with a mission to advance careers, businesses and communities, will provide the Future Skills Centre with a purpose-built digital infrastructure to grow and sustain a pan-Canadian network. With its integration with Orbis Communications, Magnet has a reach of over 1.1 million students, alumni and job seekers. It also has a network of over 500,000 employers, 67 economic development and industry association partners, over 300 community partners and 72 Indigenous serving organizations. The Future Skills Centre will use Magnet’s expansive reach, its technology-enabled network and partnerships with other leading skills and talent connection platforms—including the Canada Job Bank and EMC’s ManufacturingGPS. What the skills are that will be needed in the future is an important issue for students. In her comments on the panel, Gladys Okine noted that not knowing exactly what skills are going to be needed can be daunting. Many of the youth she works with through First Work are already experiencing changes in the world of work. Okine is part of a 15-member team from Canada’s public, private, labour and not-for-profit sectors selected to form the Future Skills Council. The Council will provide advice to the Minister of Employment, Workforce Development and Labour on emerging skills and workforce trends including national and regional priorities related to skills development for Canadians. Lawrence Daniels is the Chief Executive Officer of FireSpirit, a growing Manitoba Indigenous Human Resources Company. FireSpirit is working to build human resources and provide employment services to Aboriginal and northern communities.